Although I suppose you could say that I had ‘seen’ Mercury as a tiny black dot traversing a projected Solar disk during the transit in 2003, I have always wanted to see it properly. But Mercury only travels a short way from the Sun and so is never viewable much above the horizon; it’s never visible from where I live. I thought I saw it driving home one evening years ago, but wasn’t sure. I had trekked up the hill near where I live a few times, hoping to see it at dusk, but always been thwarted by a cloudy horizon. So when I read that it was approaching a once-a-year dawn elongation and the weather was set cold and clear I knew I was going to have to get up early and have another go. I used to get up at 5 a.m. every weekday, but it’s been years and I’m not used to it anymore. Crawling out of bed into a cold dark house; hunting around for my glasses in the dark without waking my wife; grabbing an instant coffee and a slice of bread and jam whilst the car defrosts; tripping over sleepy cats meowing for breakfast; driving in a woolly hat, breath frosting the screen – these are all things I’ve willingly forgotten. So the early rise was a shock. Somehow I dragged myself, countless layers of clothing, two Questars and a Tristand belonging to my mate Ian into the car and drove a treacherous, frosty mile to his house. The car thermometer registered minus four but it felt colder. Everything was thickly frosted, the roads slippery and shiny and strewn with salt. An ambulance was parked, flashing ominously, outside someone’s house. Ian was waiting on the curb in a thick jacket, breath steaming. Above, a gibbous waning Moon and brilliant Jupiter were dropping to the West. We set up Ian’s old Prinz refractor between parked cars at the curbside and found Venus - glittering with false colour - rising low in the East with Saturn a little way above it; there was no sign of Mercury. There were too many streetlights obscuring anything faint and low with their orange brilliance, so we headed upwards and outwards, parking in a layby on a country road and dragging the Questars along a track that leads to a nearby farm. 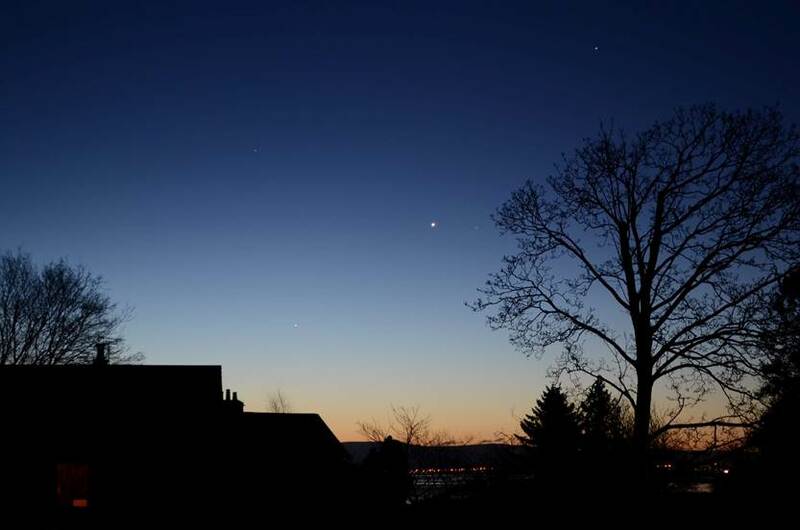 We knew at once that we had found the right spot – Venus and Saturn were obvious now and we could see the whole Eastern horizon, still quite dark at five thirty, across the Bay. Having set up, found Polaris in an unfamiliar sky and aligned the Questars, we breathed into our hands, stamped our feet and waited. I scanned the dark line of hills above the lights of Hest Bank and Carnforth with my 15x56 binos. Then I saw it, a jewel of glittering reds and greens set in the murk where the sky began – Mercury. Whether you fall into the ‘love Questar’ or ‘hate Questar’ camp, you have to admit few fully-tracking telescope systems are as portable. The built in finders and switchable barlows made it easy to follow Mercury as it rose out of the murk on the horizon, the image gradually steadying. For at least half an hour, Mercury jumped and boiled and threw off coloured scintillations. Swapping eyepieces, focusing and re-focusing, did nothing to steady the image. We could see that it wasn’t a star, but not what phase or colour (or even what size) it truly was. To the naked eye it remained surprisingly faint, much less brilliant than Venus and only shining clear above the murky horizon as the sky began to turn from black to blue. As the sky lightened into an orange dawn and threatening clouds to the west held off around the Moon, Mercury rose higher, following the arc of Venus, Saturn and diamond-white Spica above it. Now, even as the sky-glow of dawn overwhelmed it to the naked-eye, the image of Mercury in the 12mm Questar Brandon eyepiece gradually steadied until I could make out a tiny, brilliant-white half-disk like a mini Venus - pointing down towards the Sun. Even at magnifications of 200x to 300x, the half-disk appeared tiny and never completely steadied in the boiling thick atmosphere near the horizon. There was no chance of spotting surface detail; I doubt there would have been in any scope. We continued to follow Mercury until it was lost in full daylight, even to binoculars, and we were frozen and hungry. We had a final quick look at the setting gibbous Moon, with Posidonius and Mare Nectaris on the terminator, then packed up, trekked back to the car and off to Sunday breakfast just as the Sun was rising and sane people were starting to wake. A few days earlier even the Postman had mentioned seeing Venus at the start of his round, but most people, waking on that sunny Sunday at the start of advent, will have been oblivious to Mercury. I was surprised at how difficult it was to find (and still harder to see as a planet with a phase), even from a dark vantage point with a full horizon view. I am no longer surprised that at one time even Mercury’s rotation period was uncertain. Perhaps it is easier as an evening star, but it might be years before favourable elongation, weather and circumstance allow me to find out. Three mornings later (the day after greatest elongation), I woke early and wondered if I could see Mercury from my south-facing balcony. As expected, I couldn’t; but the rising slope of the field behind my house gave a vantage point for photos at least. Then when I’d finished snapping, I took the NP127 out onto the balcony to look at the last quarter Moon, only to spot Mercury, just fading into invisibility against the dawn. So in fact, for an hour a day, on a few days every year, I can get Mercury from home.